Being an island of course the only way to get to Cheung Chau is by boat! There is a very regular ferry service running from the Central Pier #5 on Hong Kong Island which is run by the New World First Ferry company. To reach the pier take the MTR to Central station or Hong Kong station and walk towards the sea using the elevated walkway system. The piers are numbered from 1 though 10 in sequence so it is easy to find the #5 that goes to Cheung Chau. Two kinds of boats are operated, a larger three level boat known as the "slow" or "ordinary" ferry which makes the trip in 55 minutes. While a smaller faster boat, known as the "fast ferry" takes only 35 minutes. Both types can be taken from the same ferry pier in Central and arrive at the same pier on Cheung Chau. While the fast ferry is, obviously, faster the slow ferry has the advantage of having outside areas from which to enjoy the view, so unless you are in a great hurry do consider taking the slow ferry either to or from Cheung Chau. On hot days air-conditioning may be appreciated and this is available on the top deck of the slow ferries, and on the whole of the fast ferries. A supplement is payable to go to the top deck of the slow ferry, the "deluxe class", which also gives access to the back observation deck on the majority, but not all, of the slow ferries. Even the smaller fast ferries are quite large seating many hundreds of people in comfortable padded seating similar to airline seats but have no outside access. The slow ferries have a mix of seating styles including chairs and tables on the upper decks. Automated drink machines sell soft drinks on the ferries and the slow ferries have instant cup noodle machines, but otherwise it is best to take your own refreshments for the journey. 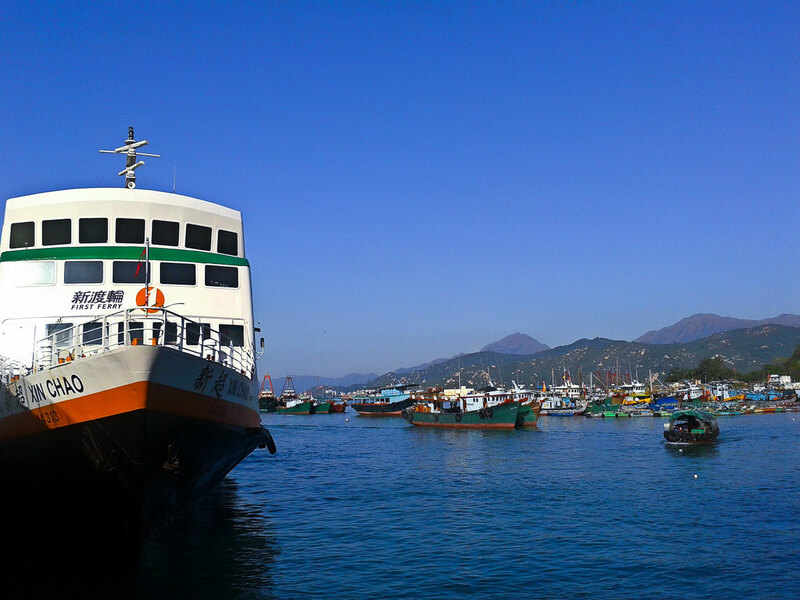 During the day time the ferries run about every half an hour, alternating between fast and slow ferries, and there are more during the regular commuter times as these ferries are also used by the many residents of Cheung Chau who commute to work elsewhere in Hong Kong. Only during the darkest hours of the night are ferries less common, with only 4 running between midnight and 6am. If you are staying past midnight on Cheung Chau consider staying over at one of the many holiday flats available for rent from kiosks near the ferry pier. For those visiting Cheung Chau in a group another option is to hire a private junk, not as expensive as it may sound if your group is large enough this option gives you great flexibility and is highly recommended when visiting Cheung Chau for the Bun Festival Parade as at that time the regular ferries are very busy and long waiting times may occur. The same ferry company operates a circular Inter-island ferry route that takes in Mui Wo on Lantau, Peng Chau, and Cheung Chau. This is a great option for those wanting to see more than one of the outlying islands, or perhaps wish to mix a visit to the Lantau Po Lin Monastery and Big Buddha with a seafood meal on Cheung Chau. From the Po Lin Monastery take Lantau Bus No.2 which goes to the bus stop in Mui Wo which is right beside the Mui Wo ferry pier, from there take the inter-island ferry to Cheung Chau. The trip is on a smaller two deck ferry with outside observation deck and takes about 35 minutes. A lot of people come to Cheung Chau specifically for the food, and there are indeed a range of traditional and modern choices. As a historic fishing village it is of course very related to seafood, fish and marine products. Here you will find a full range of seafood dishes, but also traditional Hong Kong Cafe fare, Cantonese Dim Sum and international choices as well. Catering to the large number of visitors who are coming to Cheung Chau for a seafood lunch or dinner there is a stretch of seafront with many seafood restaurants. Each one has tables by the sea as well as some indoor seating. Focusing on providing food for visitors it concentrates on rustic and traditional Cantonese presentations of seafood. Try a steamed fish with ginger and spring onion, stir fried little clams with chili, crispy deep fried squid or steamed garlic prawns. Typical accompaniments such as plain or fried rice, beef and broccoli stir fry and sweet and sour pork make for a complete meal and cater to those who do not like seafood. © Copyright 2013, cheung-chau.com, All Rights Reserved.